The Model 55F never appears in the world of DOS Retro PCs. Why is that? Because it is simply superfluous in the DOS world. The TEAC FD-55F is a double-sided 5.25 inch drive that can write 96 tracks per inch (TPI) with 9 sectors per track. In other words, the capacity of a floppy disk is 720 KByte. This corresponds to the capacity of the standard 3.5-inch double-density (DD) drive. This 3.5-inch format has been supported since DOS version 3.2. This was probably one reason why the 5.25 drives with 720 KByte did not find their way into the IBM world. Floppy disk formats supported by PC- and MS-DOS. FORMAT [drive] /4 - formats a standard double sided, double density disk (360 KB) on a quad-density disk drive. Note: Each OEM determines which switches will be supported by the FORMAT utility included with the versions of MS-DOS sold with its computers. 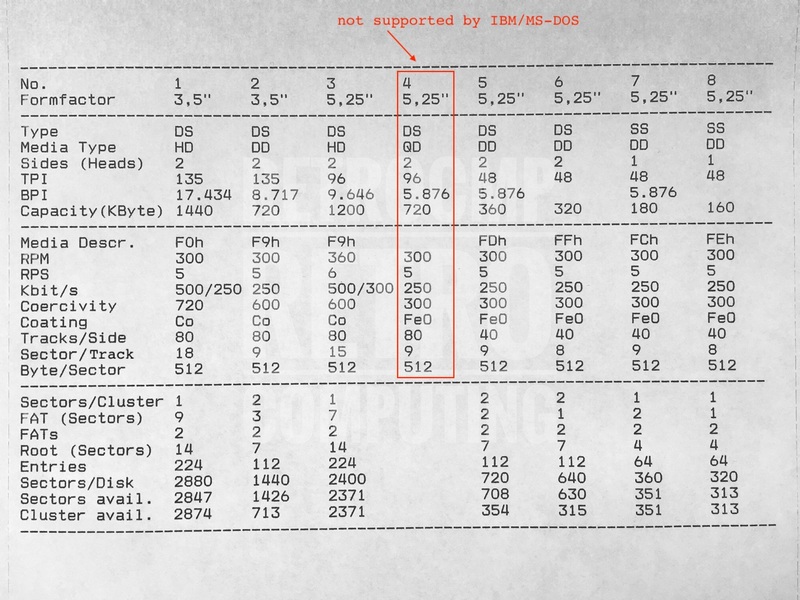 I don't know any floppy disk controller or standard BIOS that supports this so-called quad drive (QD=Quad Density) on IBM compatible computers. Also the CompatiCard supports only a pseudo format (800 KByte) but not 720 KByte. In the CP/M world the TEAC FD-55F can be found very often. There are a lot of disk formats with 80 tracks or 96 TPI. You can easily test this with the DOS program 22DISK. Simply select the appropriate format and format the diskette (initialize). This works without any problems. You even get a hint from 22DISK that 96 TPI (5.25 inch) are only supported by 1.2 MByte drives or by the TEAC FD-55F! You have to be a little careful with the jumper settings. I have for example the type FD-55F-30. This has no DISK CHANGE (DC), but only the READY (RY) jumper. In other words, this drive does not work on an AT (I also tested it), but on a PC/XT, see also under Jumper settings. Another special feature is the XT jumper, which I don't use, I only use RY. 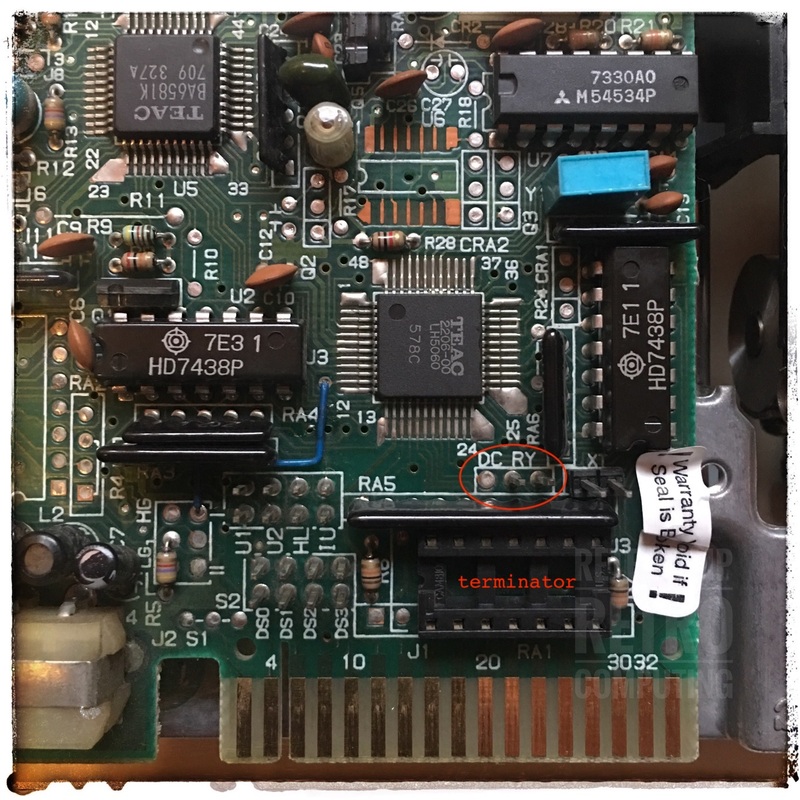 On the picture above you can also see the so called terminator or resistoe pack. It is not set because I am using the TEAC FD-55F as drive B:. Only the last drive on the cable must have a resistor installed! Attention! The TEAC FD-55F requires a 14 PIN resistor with 330 Ohm! The first command formats a diskette in drive B: in CP/M format DS, DD, 96 tpi (kay4) for the Kaypro Pro-8 Rom. The second command copies the file test.txt to drive B:. With Uniform I selected the CP/M format "Kaypro Pro-8 Rom DSDD:96:CPM". Under PC-DOS the access is quite simply possible with DIR B:. The file test.txt is displayed correctly.